I am one of you. I joined your ranks 13 years ago and have been in the trenches of education for these years, right by your side. I consider myself so lucky to have this job, and yet I’m also so aware of the challenges that we all face every single day. I know about the long hours, the constant to-do list, and the feeling of never being quite good enough. I spend my days wondering how I am going to do all that needs to be done, and also realizing there’s nothing else in the whole world I’d want to do. This past school year I had the interesting experience of sitting on the other side of the desk for the first time. I was now sitting at the shiny red table, surrounded by other adults in tiny plastic chairs, at Kindergarten orientation. While I sat there, staring at this stranger who would soon become the most important adult in my son’s world, I had an awakening. As I listened to her explain how his year would go, I hung to every word she said. He was my whole entire world and I was going to turn him over to her- to let her shape him, mold him, and make or break his impression of school. I knew that she held the power to make my son love or hate school…. a belief that could be very hard to change once it was formed. As I left orientation it clicked- Oh my goodness, my job is REALLY important. Like, REALLY REALLY important. You see, not only did this wonderful woman who would go on to be my son’s world hold this power, but I TOO held this power… for someone else’s child. I always knew being a teacher was important. Once I became a parent I became a much better teacher. I realized that every child in that room was loved in a way I didn’t know was possible prior to becoming a parent. 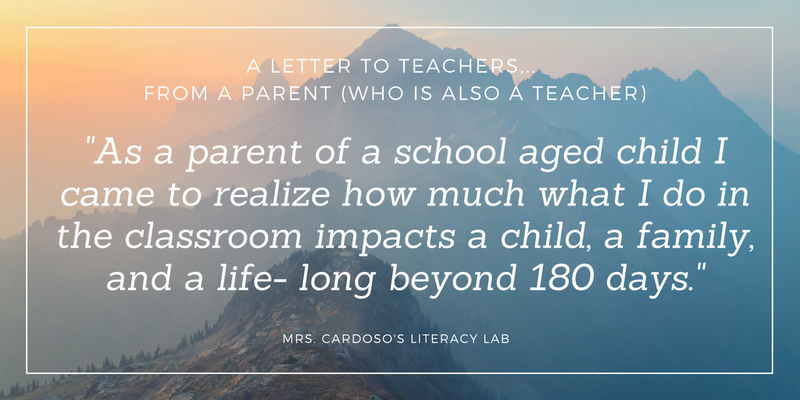 Yet, now that I was a parent of a school aged child, I realized just how much what I do every day can impact a child, a family, and a life- long beyond the 180 days we spend together. As teachers, do we recognize that a child has a life outside of our four walls? Are we assigning homework that we would want our own child to do? Are we providing a home-life balance we would want for our own kids? As teachers, are we making a personal connection to every child? Especially those quiet kids who blend in to the background? Because my son… he can be one of them. And I don’t want him forgotten. As teachers, are we facing each situation with kindness? Every year we face kids who are so challenging we stay up at night thinking about them. Are we treating them the way we’d want our child treated? Do we realize that other kids watch how we treat them and model their behaviors off of us? As teachers, are we giving it our all, every single day? Are we not giving up on a child before we even give them a chance? Are we forcing ourselves to try something new when the old trustworthy plan isn’t working? Above all else, as teachers, are we loving these kids? Because really, as a parent, I can let a lot slide. I can overlook many things, but I can not overlook how my child feels in your presence. Are we remembering that how a child feels about school can be the single most important factor when it comes to determining their success? So, to all my peers out there- near and far- have a great school year! Get some rest while you still can, or take some time for yourself if you’re already back. But at the end of the day, every day, remember that to every child you encounter you are the most important factor that determines their success- academically and emotionally. It’s a lot of pressure, but you’ve got this!